At least had the sense to lock it up. Be nicked in a moment otherwise. Mordor Central would really benefit from short-term indoor bike parking for those using the ticket office / shops / loo like they have at York. It's not like there isn't space. Problem is, given the quality of the alternatives, everyone would immediately lock their bikes to it and sod off on a train somewhere. This is a serious bugbear of mine, which I doubt will get fixed at any station run by non-cyclists. Simple scenario; what if you want to use the loo while waiting for a (probably delayed) train? 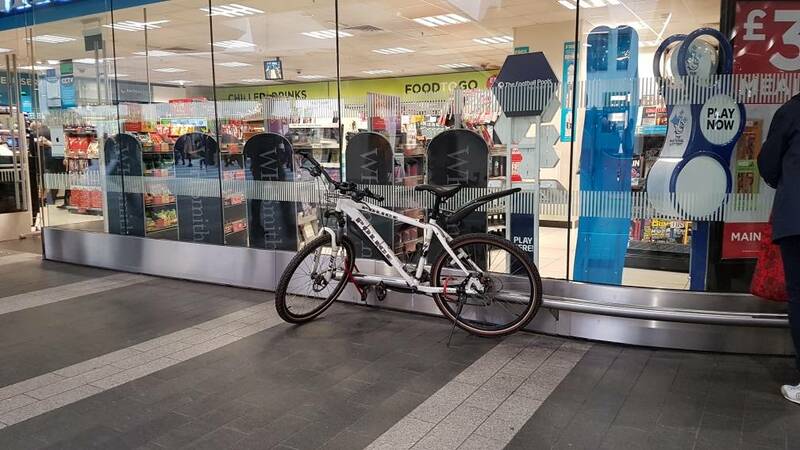 I nearly got arrested at Edinburgh just before the Commonwealth Games for locking my bike outside the gents. mea culpa! Take it into the disabled loo with you? Simple scenario; what if you want to use the loo while waiting for a (probably delayed) train? I think what you're supposed to do is go outside, lock it to one of Euston's finest double-decker bike parking spaces using your touring-grade cable lock, then carry your four panniers and any loose accessories into the toilet cubicle which barely has room for a sanitary bin. And hope the bike's still there when you shuffle back. In more civilised places I tend to ask someone working in the cafe or the ticket office or whatever if they can keep an eye on my bike while I nip to the loo. It's one of those things where being in fully loaded touring mode helps, people generally being more predisposed to being helpful to a traveller on a mission rather than just a bloodycyclist. I've done this too, but only at quiet times or when [TMI] means I'd be legitimately using the accessible toilet anyway. My bike is my wheelchair/ mobility aid. Was that in 1970 or 1986? [OT] We were forced to change trains at Mordor Central yesterday and got parked at that crips' parking /National Rail office place on the bridge. The BTP chaps who have a little office in that place were wearing SERIOUS hardware. The hardware worn by lads on a Tel Aviv bus looked positively lightweight in comparison. Ah yes, I noticed that plod bike the other day while in Mordor which was CRAWLING with military types for "lets recruit while claiming to remember war" season. USAnians sometimes ask on social media "how do brits defend themselves against blah bah" when they can't carry guns and their police are unarmed? The answer being that the police who are armed, are armed with serious kit, and are actually trained (unlike US police officers, most of whom's training seems to consist of a physical ability to wear a gun). Ah, the one in Glasgow. There were FOUR heavily-armed blokes who came and left. Yep, earlier this year a couple of seasoned SF types informed me that the Mets specialist teams where now every bit as effective as they themselves were. I can confirm that the firearms course I underwent in 1997 was more in depth than some of the training i undertook in the military. Mine was firearms light initially as well as my crrying was more for static protection of the PM than anything else. It did develop into more tactical training later. After my authorisation ended, I witnessed other tactical team training and AFV training. Very in depth and with lots of scenarios in mind. The average firearms officer today (in the UK) is VERY highly trained.